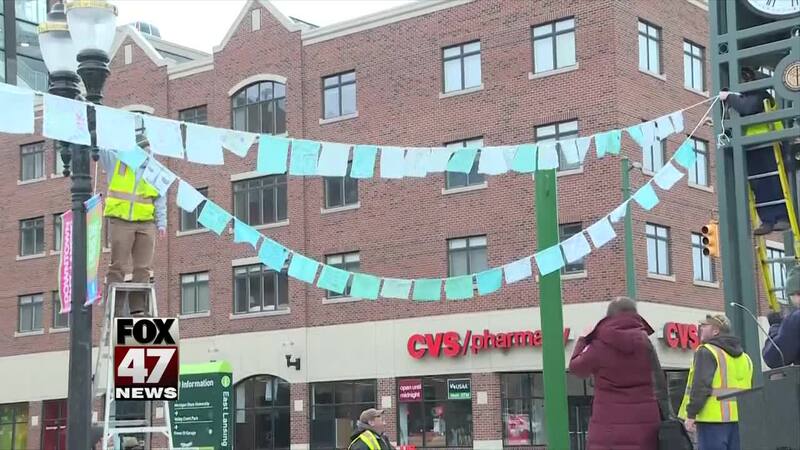 On Thursday a dedication ceremony was held for a display recently put up in East Lansing that honors the more than 500 known survivors of Larry Nassar's sexual abuse. EAST LANSING, Mich. — On Thursday a dedication ceremony was held for a display recently put up in East Lansing that honors the more than 500 known survivors of Larry Nassar's sexual abuse. 505 teal flags have been put up along Grand River Avenue, a flag for each "Sister Survivor." The idea of the teal flags actually came from a group of survivor parents. The group, Parents of Sister Survivors Engage (POSSE), wanted a project that would potentially be healing for survivors, and be a physical reminder to the community of the survivors that are among us and what they've overcome. Thursday morning East Lansing Mayor Mark Meadows, a sister survivor, and POSSE representatives gave remarks about the special installation. Each of the 505 flags has a message written on it from Michigan State University students and community members. Most of those messages were encouragement and support for survivors, but some of the messages were actually an outlet for others to express their own stories of survival from abuse. "It has been transforming in a way, to stand at the tables, and to see the students come forth, and sometimes pour out their hearts in the messages that the wrote on the flags," said Joan Meinke, a parent of one of the survivors, and one of the organizers of the teal flag project. "For me, it has been a part of the healing process, and I pray that for the survivors, as they see those flags and see them twist in the wind, that it too will be healing for them." Organizers of the project also hope the flags will help survivors that have never come forward finally feel supported enough to tell their stories. The display will be up throughout April, which is Sexual Assault Awareness month. They can be found along Grand River Avenue, and adjacent to Ann Street Plaza in downtown East Lansing. When the flags are taken down, they will be given to individual survivors to keep. Putting up hundreds of flags was a massive effort made possible by MSU students and campus organizations. East Lansing area quilters and sewers also donated their skills and supplies to make the idea of teal flags, a reality.